Bellis perennis is a very common European species of daisy, of the Asteraceae family, often considered the model type for the name "daisy". Many related plants also share the name "daisy", so to distinguish this species from other daisies it is sometimes qualified as common daisy, lawn daisy or English daisy. The plant resembles Leucanthemum vulgare,a similar plant in the same family. Bellis perennis is native to western, central and northern Europe, but widely naturalised in most temperate regions including the Americas and Australasia. Bellis is the Latin word for "pretty", "beautiful"; this word was used also as the name of the plant, and Pliny the Elder wrote Bellis in pratis nascitur, flore albo... ("The daisy that grows in the meadows, with a white flower..."). perennis, Latin for "that lasts the whole year", "perennial". For common names, see the article in Wikispecies on Bellis perennis. B. perennis var. caulescens Rochebr. B. perennis f. discoidea D.C.McClint. B. perennis var. microcephala Boiss. B. perennis f. plena Sacc. B. perennis var. pusilla N.Terracc. B perennis f. rhodoglossa Sacc. B. perennis var. strobliana Bég. B. perennis f. tubulosa A.Kern. Erigeron perennis (L.) Sessé & Moc. It is an low herbaceous perennial plant with short rhizomes and rosettes of small rounded or spoon-shaped leaves that are 2–5 cm (0.8–2.0 in) long and grow flat to the ground. The flower heads are 2–3 cm (0.8–1.2 in) in diameter. Although the 'flower' may appear to consist of a yellow centre with white petals, this is not the case. Each individual "petal" is itself an individual flower; these flowers are called ray flowers. In the centre (the "disk") there are also many tiny yellow flowers; these are called the disk flowers. The different colours and styles of flower work together in order to attract insects. The flower heads are produced on stems without leaves that are 2–10 cm (0.8–3.9 in) tall. The chromosome number is 2n = 18. Bellis perennis is native to Northern Africa (Morocco), Southwestern Asia, and Europe; widely introduced and naturalised elsewhere. The species habitually colonises grasslands, including lawns, and is difficult to eradicate. Wherever it appears it is often considered an invasive weed. This daisy may be used as a leaf vegetable. Young leaves can be eaten raw in salads or cooked, noting that the leaves become increasingly astringent with age. Flower buds and petals can be eaten raw in sandwiches, soups and salads. It is also used as a tea and as a vitamin supplement. Bellis perennis in a meadow. Bellis perennis in Marburg, Hesse, Germany. Young plant of Bellis perennis with flower. A complete plant of Bellis perennis with flowers, leaves and the roots. ↑ 1.0 1.1 1.2 1.3 "Bellis perennis Linnaeus". Flora of North America. @eFloras.org. Retrieved 29 November 2013. ↑ "Bellis perennis L. - Lawndaisy". Natural Resources Conservation Service. United States Department of Agriculture. Retrieved 29 November 2013. ↑ F. Gaffiot. Dictionnaire Latin-Français, Hachette, Paris, 1934, p. 1145. ↑ "Bellis perennis L." The Plant List. Royal Botanic Gardens and Missouri Botanical Garden. 2010. Retrieved 29 November 2013. ↑ "Bellis perennis L." Tropicos.org. Missouri Botanical Garden. 1 December 2013. Retrieved 29 November 2013. ↑ "Bellis perennis Linnaeus". Flora of China. @eFloras.org. Retrieved 1 December 2013. ↑ "Weeds of the Northeast". Introduced, Invasive, and Noxious Plants. United States Department of Agriculture Natural Resources Conservation Service. Retrieved 1 December 2013. ↑ "Bellis perennis L." Missouri Botanical Garden Bellis perennis. Retrieved 1 December 2013. ↑ "Bellis perennis L". Plants for a Future database. Retrieved 1 December 2013. 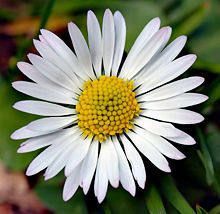 Wikimedia Commons has media related to Bellis perennis. Wikispecies has information on: Bellis perennis. This page was last changed on 26 March 2019, at 01:08.